While properly painting the exterior of your home undoubtedly helps improve curb appeal, it also prevents moisture damage, wood rot, and other wear that can arise during seasonal weather changes. But once your home is painted, you can’t just forget about it and walk away. Upkeep is also critical for ensuring your exterior paint stays intact and your home remains protected. Many homeowners often overlook this important step of exterior home painting — which can be an expensive mistake. The following tips can help you make your exterior paint job last longer, so your house looks beautiful and stays functional between repaints. Moisture issues inside your home. Do you have a leaky roof or overly damp basement on your hands? Perhaps your bathroom or kitchen packs in a lot of moisture and isn’t vented properly. Whatever the issue, these water problems and others inside your home can wreak havoc on exterior paint, causing it to peel, mold, and bubble. It’s always best to fix roof leaks as they occur, use a dehumidifier in your basement, and properly vent moisture-heavy rooms to the outside of your home. If you notice extensive water damage, it’s important to call in professionals to keep your exterior trim and siding safe from harm. Wood damage. Rain, wind, snow, and debris can give your exterior wood trim and siding a significant beating over time. This can cause wood to rot, splinter, and crack. Repairing splintering, replacing rotted wood, and addressing other damaged wood areas on your home can help ensure that exterior paint stays in place and repainting goes smoothly. Dirt, mildew, and other debris on your siding or trim shouldn’t be ignored. Not only are these materials an eye sore on the exterior of a home, they can also cause major damage to exterior paint if left alone. Opting to clean your siding and trim on an annual basis will work to extend the life of an exterior paint job and protect your investment for years to come. You can find siding cleaner, anti-mildew solution, and other siding cleaning supplies at your local paint or home improvement store. If you’re unsure where to start, professional exterior painters also have the expert knowledge and capabilities to clean a variety of surfaces such as aluminum, vinyl, brick, stucco, block, concrete, and more. Taking time to prepare surfaces properly. From wood repair and replacement services, to sandpapering rough areas, and cleaning your siding and trim, professional painters will prepare your home exterior so that paint adheres properly, smoothly, and lasts for many years. Using the correct painting equipment and tools. Professional exterior painters use only the right tools to get the job done quickly and efficiently. Homeowners who take matters into their own hands may not know how to acquire or use the painting equipment needed for a long-lasting, professional-looking paint job. Selecting high-quality paints and finishes. Expert exterior home painters will use only the highest-quality paints to protect the outside of your home and keep it looking new. Whether you need to paint aluminum, cedar, HardiePlank, or stucco, they’ll know exactly which type of paint and finish to use on your home. Between weather changes and normal lifetime wear, your home’s exterior will need to be repainted every seven to ten years. By following the tips outlined above, you can ensure that your exterior paint lasts longer and looks great well into the future. Are you ready to repaint your house? Get a free exterior painting quote today. 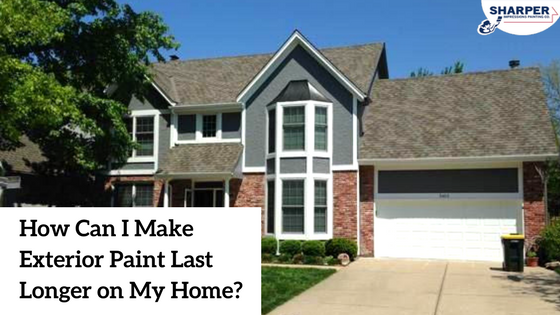 Home » Recent Projects » How Can I Make Exterior Paint Last Longer on My Home?